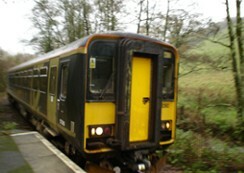 Causeland Station, on the Looe Valley Line. 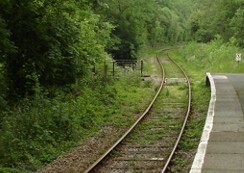 Causeland Station, on the Looe Valley Train Line, is the real version of Barrow Hill's Wychwood Station. It is here that the archaeology protestors arrive, to begin their mission. 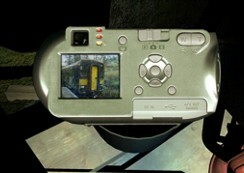 The real station can be seen on Trevor's camera, which can be found in the barn. In reality, Causeland is a tiny station with a single platform. The views from the train, as it passes through the Cornish Valley, are breathtaking and forever changing. It is also interesting to note that the train passes the swamp lands which inspired the reedy bogs seen in Barrow Hill. Lastly, Matt Clark (the creator of Barrow Hill) took part in a paranormal investigation at this station. See the findings, read the casefile, at the This Haunted Land website. Right: The station, as seen on Trevor's camera.